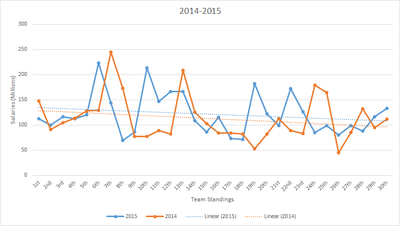 I started this research to find out if a higher team payroll actually leads to more success in Major League Baseball. 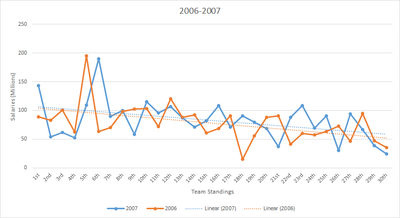 After doing the research of salaries per team for the past 10 years versus each teams finish in the final standings in each respective year, I think a high payroll doesn't hurt but I'm not sure if it necessarily helps. Lets assume a team should finish in the order of how much money they spend on players each season. Going by that the team with the highest payroll should win the World Series every year, and the team would with the lowest payroll should have the worst record each year. Interestingly enough, of the teams that have spent the most on payroll each of the last 10 seasons, only 1 team (New York Yankees, 2009) has gone on to win the World Series. Of the 10 seasons, the New York Yankees had the highest payroll in 8 of them, and only made it to the championship series or farther in 2 of those seasons. On the flip side of this, something I did notice however, was that in each of the last 10 seasons the team that spent the least amount of money on payroll, finished with the worst record in baseball 4 times. I chose to break up the comparison tables in to 2 years to make it easier to see, but I think you can still get a general understanding of how payroll effects a teams success. 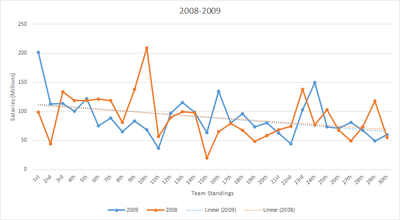 In the seasons 2006-2007, the teams with higher payroll were generally near the top, however the team with the highest payroll finished 5th in 2006 and 6th in 2007 respectively (New York Yankees both times). The Tampa Bay Rays had the lowest payroll in 2007 and second lowest in 2006 (behind the Florida Marlins) and finished with the worst record in both seasons. 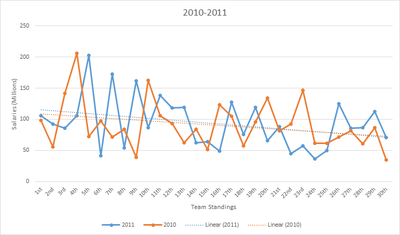 The 2008-2009 seasons were a little bit more unpredictable in terms of payroll vs success. The Yankees did win the World Series in 2009 with the highest payroll, but the the New York Mets had the 2nd highest payroll and finished near the bottom of the standings. In 2008, the Yankees had a payroll of $209.1M, while the 2 teams that played in the World Series (Phillies/Rays) had a combined payroll of $142.1M. The years 2010-2015 were somewhat similar to the previous 4 years. While you can't draw a direct comparison between success and payroll, I think you can say that if your team spends money they may not win the World Series, but more than likely they should finish near the top. If your team has a very small payroll they will probably be near the bottom of the standings. 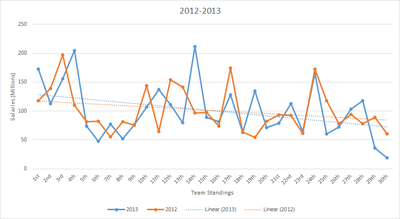 Overall there is a downward trend each season as to where a team finishes and how much they spend on payroll. Based on the payrolls for the current season, the World Series would be the Los Angeles Dodgers ($249.5M) vs the New York Yankees ($228.3M). Based on previous years, I think its safe to say that this will more than likely not be the outcome. Who do you guys think will play in the World Series? Will it be NYY vs LAD?